The data monetization market has highly competitive landscape owing to the presence of numerous large players, TMR observes. Some of the key players operating in the global data monetization market are Infosys Limited, Dawex Systems, Connectiva Analytics and Insights Ltd., and CellOS Software Ltd. In order to improve reach to the customers, these companies are trying to improve their distribution networks and global presence. They are focusing on the development of the improved services and software solutions to the numerous customers. In order to improve their product portfolio and advancement of their existing product, these companies are entering into strategic business activities such as acquisitions, mergers, and strategic partnerships. 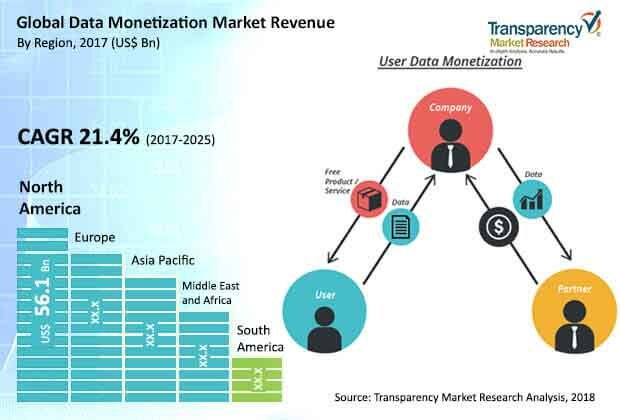 According to the report by TMR, the data monetization market is expected to expand with a CAGR of 21.4% over the forecast period of 2017 from 2025 to reach the valuation of US$ 708.86 Bn by 2025. Based on the method, the direct data monetization segment dominated the global data monetization market with a share of 60.1% shares in 2017. Based on the region, North America dominated the market by accounting for revenue of about US$56.1 bn in the same year. In order to improve customer satisfaction and experience, numerous companies are inclined to the data monetization. The telecom companies are facing intense competition due to changing infrastructures coupled with the emergence of Over-The-Top (OTT) services. This change and emergence of other technology are creating need for strong infrastructure set up to support the new technology. The improvement in the technology and its emergence has propelled adoption of the technology and likely to drive growth of the global data monetization market. Additionally, rapid advancement and emergence of the in big data is a key trend observed in the market. Adoption of data analytics solution and monetizing utility data is the next logical step to analyze data generated from automation technology. The data is analyzed which is collected basically from the connected homes and smart utility meters, by using this smart data meters, the utilizing companies are trying to improve performance and reduce the cost. In addition, the rise in awareness levels about the benefits of the data monetization such as production, cost reduction, and improving efficiency is driving growth of the global data monetization market. Despite the presence of these growth prospects, some issues related to data privacy and ownership of solutions are affecting the large-scale adoption of data monetization which is likely to limit growth of the market. Nevertheless, the initiatives of government such as imposing stringent regulations on piracy of data and governing the processes and the third party data transfer with their consent. This factor is creating opportunities to boost its adoption across numerous sectors over next few years. Furthermore, the data monetization helps to focus on businesses to enhance customer experience and improve productivity. Thanks to these advantages, adoption of the solutions is increasing and creating lucrative growth opportunities for key players for upcoming years.